Being a skeptic about sequels I ordered this book mainly because I am a closet Harry Potter "groupie". Yes, I read the books in my 50's and have "Pottermore" on my computer favorites! Besides being a "sequel" the book is presented in script form, written as a read through and directive for scene settings of a play. How can any of those things compare to the addicting words and characters of J.K. Rowling? Well, it hit the mark for my unquenchable thirst for continuing the saga of Hogwarts and it's favored alumni. I felt an immediate connection to Harry's, Hermione's and Draco Malfoy's children. The story of Albus and Scorpius had a more contemporary feel but I loved the fact that the old favorites were included and given some closure. It took no more than a chapter to adjust to the literary structure and from there my mind assimilated the words easily and went into picture mode. I loved the story and the characters and felt a seamless continuation of the original series. My only lingering thought is: "How will this go over as a live stage presentation?" A movie? Sure. But a live stage may be a difficult venue to keep the drama and electric charge alive without the special effects. Although I will be in line for a ticket if it comes to a venue near me! You immediately see Rowling's engaging writing and development of the new characters. I am sure Thorne and Tiffany made the way easy for adaptation to play format. Their biographies show their success in that venue. 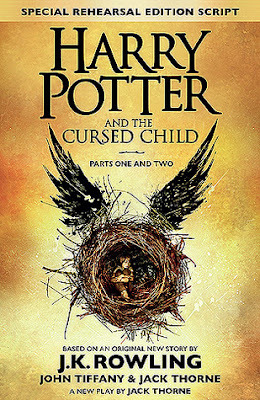 All should be proud of this addition to the Potter family of books! HP fans...definitely pick this up! I give this 4.5 "back in time" sheep! I agree with wanting a movie! (I'll sign your petition!) Although the play looks pretty interesting. Love, love the Potter books! I'm in the middle of the movie series as we speak...I never tire...sounds interesting...I don't know if I really want to go further...I kinda like not knowing. OH, this book only opens up more possibilities! Happy watching!